Everyone needs a refresher sometimes. The AutoCAD® Pocket Reference , written by two of the foremost AutoCAD® expert teachers, provides quick and easy access to everyday information needed by AutoCAD users in the classroom or on the job. It includes all of the basic concepts, fundamental commands, and step-by-step instructions. The contents, pictures, explanations, and index are unparalleled by other references, as are the price and size. This 8th edition has been improved with the inclusion of both inch and metric measurements throughout to appeal to a more global audience, as well as updated screenshots of all the AutoCAD 2018 & 2019 commands readers need. And with the inclusion of special "CAD Tips" scattered throughout, this is the perfect "cheat sheet" referenceto to make the most of AutoCAD's features and strengths..
All sections have been updated to reflect the latest AutoCAD 2018 & 2019 styles and capabilities. Improved screenshots and buttons, making step-by-step instructions easy to follow. Metric equivalents are provided alongside the original imperial measurements. SHX font importation during document upload, allowing for fully editable PDFs. “Drawing Compare” and “Shared Views,” making working with clients and third parties infinitely easier. “Center Mark” and “Centerline,” for placing center marks in arcs or circles, or changing centerlines between two lines. New “CAD Tips,” providing shortcuts and suggestions from our expert authors. More from our expert authors about the best ways to use AutoCAD software—all in a handy reference. Cheryl Shrock is a retired Professor and Chairperson of Computer Aided Design at Orange Coast College in California. The AutoCAD Exercise Workbooks are the result of both her teaching skills and her industry experience. She also is an Autodesk ® registered author. Steve Heather has more than 30 years of experience as a practicing mechanical engineer, and has taught AutoCAD to engineering and architectural students at the college level. He is a Beta Tester for Autodesk ® , testing the latest AutoCAD software, and a member of the AutoCAD ® Customer Council. 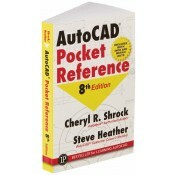 Notify me of updates to AutoCAD Pocket Reference, 8th Edition Sale!